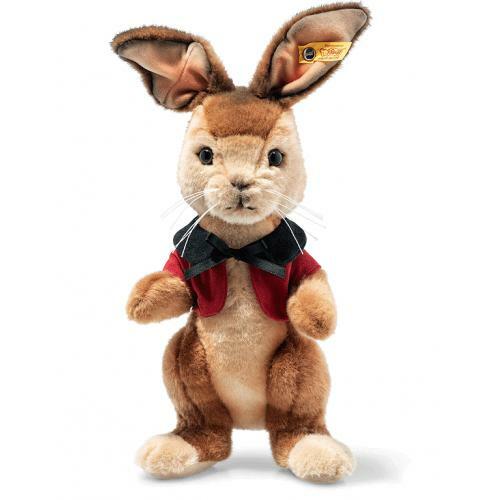 Steiff Flopsy Bunny is made by hand, in the finest brown and beige cuddly soft plush. 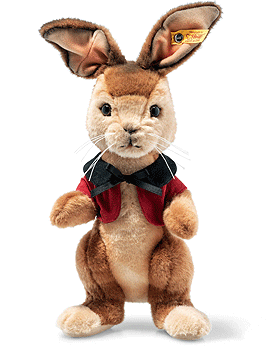 Peter Rabbit and all associated characters ™ & © Frederick Warne & Co Limited. Peter Rabbit™, the Movie ©2019 Columbia Pictures Industries, Inc. All Rights Reserved. Long text The beloved classic character Peter Rabbit was brought to life in an all-new live-action/CG motion picture based on the series of books written and illustrated by Beatrix Potter. The mischievous Peter Rabbit and his family take over the farm, throwing an endless party of fruits, vegetables, and bad behavior, but when a younger, spryer and more fastidious McGregor arrives to claim his inheritance, Peter is determined to keep the party going at the farm. It’s not long before Peter realizes he has a formidable foe in the young McGregor, who is also falling for the local painter (and the rabbits’ surrogate mother), Bea. Now, Peter will stop at nothing to drive McGregor away as the two go to war over the garden and Bea’s affection.